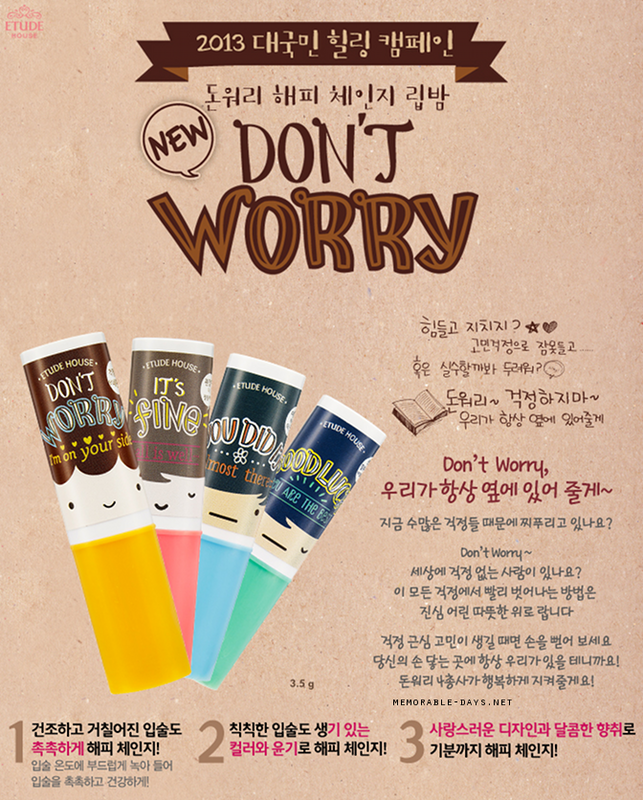 Etude House Don't Worry Lip Balm & Hand Creme | Memorable Days : Beauty Blog - Korean Beauty, European, American Product Reviews. I think we all love Etude House because of their adorable packaging. 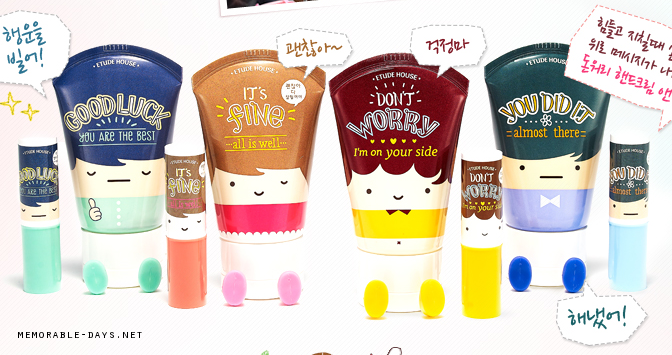 Recently, they have released a few lip balms and hand cremes with an adorable packaging and message. 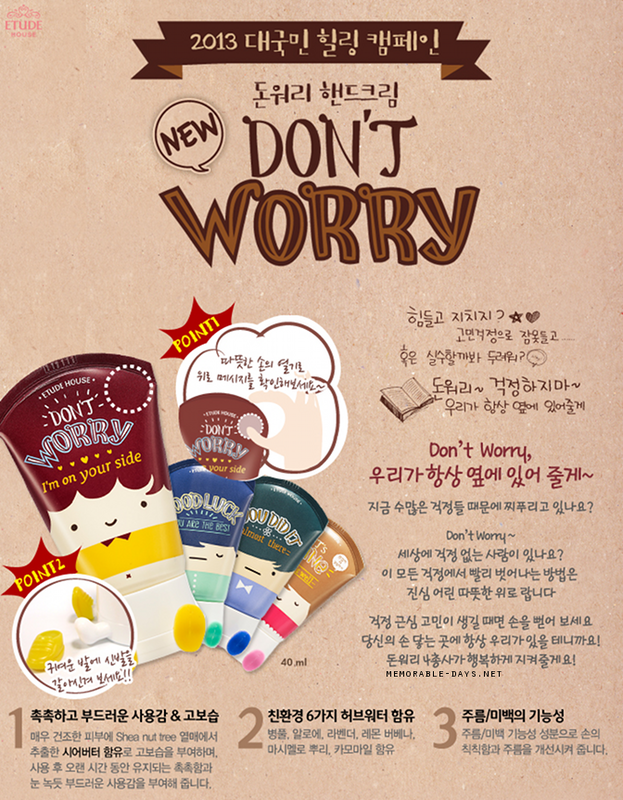 Etude House has created these for students who needs a bit of motivation during their study. You can give this to a friend, your classmate or family member and I'm sure they will be thankful because of the sweet message what's on it. Not only the message is sweet, but also the product. Each hand creme and lip balm has a different scent. Continue with reading if you want to know more! You can purchase these at testerkorea.com, kpoptown.com, cosmetic-love.com, on ebay from sellers bhg8988a and f2plus1. The price for one hand creme is between $4.90 to $11.-. The price for one lip balm is between $4.90 to $8.-. The price differs from every store. The hand creme comes in 4 scents/flavours: Floral musk, powdery citrus, citrus floral and floral fruity woody. There is 40ml of product in each hand creme. You can easily put this in your schoolbag since it's small ^^. There is 3.9g of product in it. Also the lip balms have different scents: pink version has a sweet peach scent, yellow version has a sweet mango scent, the blue version has a vanilla scent and the green version is scentless. note: all pictures are from etude house and edited by me.